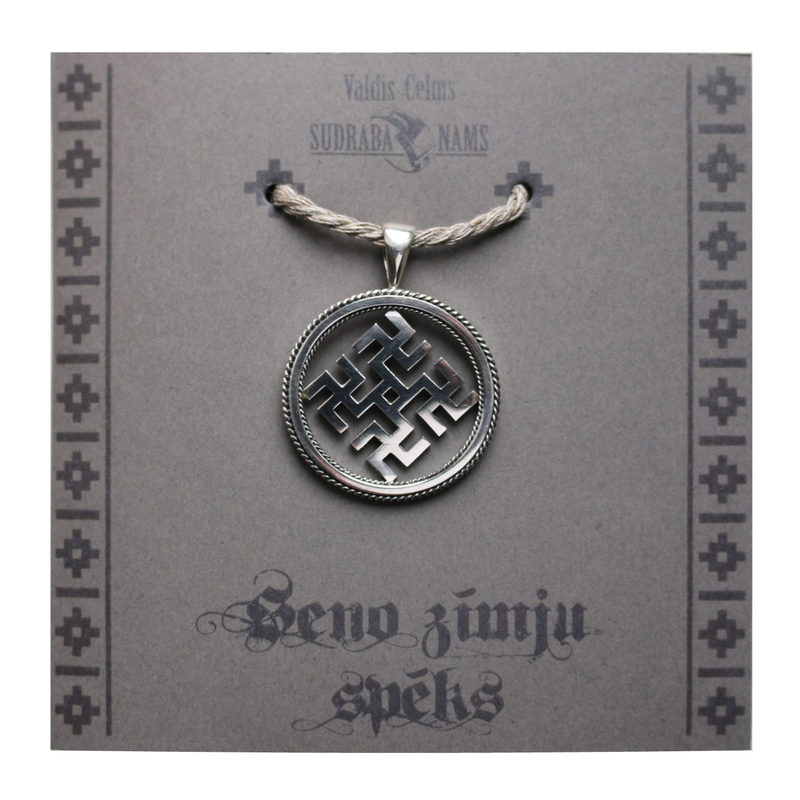 The Sun with eight spokes – an ancient Latvian (Baltic) sign, widespread in archaeology and ethnography, retained from Indo-European times - is used in the jewellery. It symbolizes the Sun, the movement of the Sun and also the world or the Universe. It is the sign of time and spatial integrity, the cycles, the rotation, the light, the warmth, the source of life, the creative energy and power from the divine beginning. The development of the personality and distinction. The source of joy and happiness. It is one of the symbols for human life, which is compared to the movement of the Sun, in the period of one day, one year or longer time. In the centre of the sign is one small free area – the soul, around which extend eight branches into eight directions and eight times. The eight times in the Sun (the world) – they are 8 spiritual and moral growth stages, that the soul should go through to reach higher level of development during the life. The Sun gives all the good and protects. The Sun is lovely as mother, who warms everyone and nourishes. The Sun – symbolizes the presence and guardianship of God, goddess Laima and Mara. It brings good luck. It helps to unite the energy. It protects from all bad. It unites the family in love and harmony.